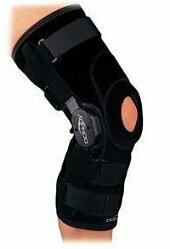 A hinged knee brace is one of the easiest ways to reduce knee pain and instability. They offer much more protection and stability than the more simple pull up sleeve and wrap around knee braces on the market. The hinges on the brace offer sideways stability and prevent the knee from hyperextending (bending back too far). This makes them perfect following ligament injuries. 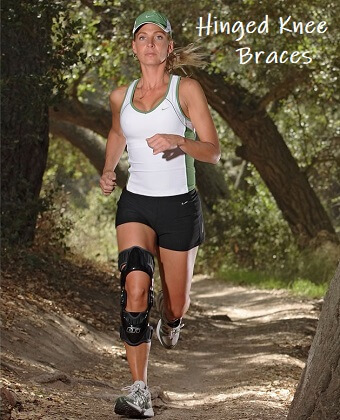 Hinged braces are also invaluable with arthritis, weakness, cartilage problems, instability and after knee surgery to support the knee, reduce pain and make daily activities and sports much more comfortable. Some hinged braces can be locked at different amounts of flexion and extension so you can control how much your knee bends and straightens. This can be really useful in the early stages of recovery from knee injuries or surgery. Hinged knee braces can be used for everyday activities or high demand activities including sports and skiing. All of these braces here provide maximum support and protection. 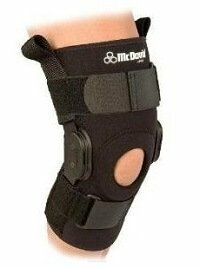 Overview: This brace is designed for moderate to severe knee instability and pain. It has two side hinges that prevent hyperextension and rigid uprights providing additional sideways support whilst allowing freedom of movement. The McDavid Pro Stabiliser II is made of lightweight materials it allows for the natural gliding action of the knee (the knee doesn’t simply bend and straighten, it needs to glide to ensure smooth movements). The neoprene sleeve provides therapeutic warmth and has a seamless, breathable back panel for improved comfort. Patellar support buttress helps improve patellar tracking (how the kneecap moves). Fully adjustable Velcro straps ensure a perfect fit for your knee. My verdict: This is my favourite hinged knee brace on the market as it offers great protection (elite level) at a very reasonable price. Users consistently give it top ratings because it is easy to apply, comfortable and effective. It is one of the most popular hinged knee braces on the market and a great purchase if you really need to give your knee maximum support. Average user rating 4.2/5. Overview: This Neo G brace has an exclusive two point geared hinge system to control flexion and extension movements preventing hyperextension. It also reduces sideways instability. The Neo G Hinged Open Knee Brace has three adjustable straps, which provides maximum joint protection and stability. The open patellar area helps reduce patellar tracking problems and pain. It is suitable for moderate to severe knee problems. My verdict: The hinge makes it easier to bend and straighten the knee whilst providing the necessary support. Simple to use and comfortable. Average user rating 4.3/5. Overview: Designed for all ligament and cartilage injuries, arthritis, chondromalacia patella, patella subluxation and patella tendonitis. The triaxial hinge and flexible steel springs provides maximum protection without limiting knee movement. The Mueller Hg80 Hinged Knee Brace is made from Hydracinn fabric (latex and neoprene free) which provides good durability and heat management to prevent excessive sweating. The contoured inner sleeve and adjustable strap at the top ensures it fits well. It has a unique antimicrobial layer which protects from bacteria, reducing odors. 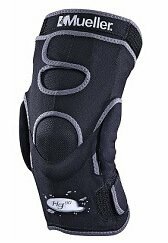 Overview: This is a superb sports and skiing hinged knee brace for knee ligament injuries and cartilage tears causing instability. It has an easy to use hi-tech pin system which allows you to control the range of knee movement if desired (flexion and extension) by locking the brace at various possible ranges of knee bend. This is perfect if you want to block specific knee movements to provide protection e.g. following knee surgery. The Playmaker also features the Donjoy Four Points of Leverage™ system which restores knee joint stability by preventing movement of the shin in relation to the thigh, reducing the forces on the ACL. The lightweight polyester-nylon weave Drytex fabric eliminates neoprene allergies and improves comfort. My verdict: This brace is great if you need to limit the amount of flexion/extension of you knee. It has four straps which ensures a perfect fit and provides great stability to the knee. 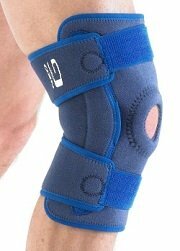 It is very easy to put on and is most commonly used after knee surgery or with ACL injuries. Most people will not require elite protection from a knee brace and find a Basic or Advanced Brace works perfectly for them. To find out more about the other types of knee braces available, click the links or visit the Knee Brace Overview section for help in finding the best one for you. It is really important to get the correct size brace, otherwise it won’t work effectively and will be very uncomfortable. Hinged knee braces are either one size fits most or come in range of sizes.